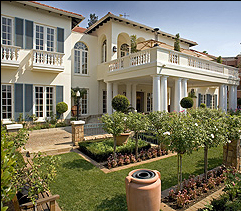 Situated in Johannesburg's most exclusive residential suburb, The Westcliff's hillside setting with cascading, sculpted gardens and elegantly opulent accommodation evoke a bygone era of leisure and refinement in one of the world's most vibrant cities. 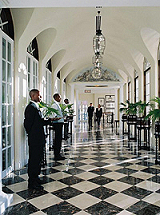 The Westcliff is a charming and romantic retreat - and its accommodations are both ergonomic and unashamedly indulgent. The extravagantly sized rooms and suites all feature gorgeous over-sized marble bathrooms and most have a private balcony overlooking the zoological gardens or one of the estate’s charming cobbled courtyards. Others feature sunny patios and the majority have glorious views of the estate’s tumbling gardens or the leafy northern suburbs, complete with lush greenery and soothing water features. The Westcliff has been turning events into occasions since 1997 and with the addition of the magnificent Jacaranda Hill, it has become one of the most desirable special event venues in Johannesburg. With its breathtaking views, elegant ambience and luxurious rooms and suites, it is small wonder that The Westcliff is renowned as the city’s most romantic destination, the perfect place for declarations of undying love! Bridal couples are offered an overnight stay at The Westcliff in a plush suite complete with romantic touches and honeymoon amenities on their wedding night, followed by a full English breakfast the following morning. And they are invited to return for a complimentary overnight stay in a luxury room on their first anniversary. The Westcliff’s highly experienced banqueting team will happily attend to every detail of the wedding, taking care of catering, décor, floral design, printing, menu cards, rolling out a plush red carpet and whatever other services that may be required. The estate offers a choice of spectacular indoor and outdoor locations and backdrops for the most unforgettable photographs. A self-contained, multi-tiered building with its own state-of-the-art kitchen complementing the superb banqueting facilities of the hotel. The Conference Centre has been strategically positioned next to the hotel’s Business Wing, where visiting conference delegates can access the executive services provided by the fully-equipped Business Centre. Barrel-vaulted ceilings, columned spaces and dramatic double-height windows entrench the splendour of The Ballroom, which also boasts a dramatic fireplace and leads out onto a wide alfresco balcony terrace overlooking Forest Town and Parktown Ridge.